In a creation myth, Vishnu took the form of a boar to rescue Bhuvedi, the Earth goddess from the depths of the primordial waters. In this sculpture, Bhudevi stands to the right of the boar’s head, while a serpent-goddess (nagini) appears in front. Rows of sages, deities and other figures appear on the body of the cosmic boar. The prominent conch shell, discus and mace below are all symbols of Vishnu. The myth of Viṣṇu, in his incarnation as a boar (Varāha) rescuing the goddess Earth (Bhū Devī) from the primeval waters, strange as it may seem at first to non-Indians, has always been one of the most popular of creation myths. Images of the god in human form but with a boar’s head begin to appear at Mathura in Kuṣāṇa times. 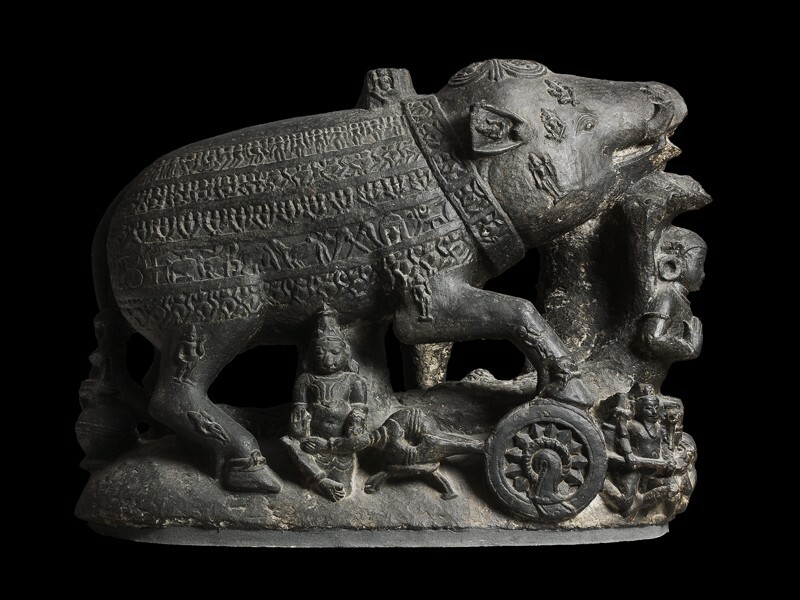 This tradition culminated in the great Boar panel of the early Gupta period at Udayagiri (Vidiśā) but continued thereafter to be a popular feature of the Vaiṣṇava iconographic repertory in most parts of India. The less familiar type of image, where the god is depicted in purely animated form, is first seen at Eran, in western Madhya Pradesh, in gigantic form; thereafter it enjoyed a considerable vogue, but one largely limited to Madhya Pradesh and Bihar. While lacking the exultant power of the man-boar images, with one leg bent at the knee propelling him upwards and the Earth hanging to a tusk or nestling in the crook of his arm, these all-animal sculptures are treasure-houses of Indian iconography, set off by details of a charming whimsicality. At least half the surface of the boar’s body is covered with low-relief figures, either single or massed in long bands. Some of these can be identified as the rsis or sages, who, according to the myth, saved themselves by clinging to the bristles of the mythical Boar. There are animals, ritual objects and Vaiṣṇava symbols. Single figures are dotted around on the boar’s head, his legs and even in his ears. Under his feet are the śaṅkha (conch) and the cakra (discus) and on the other side, where Bhū Devī stands, her head beside one of the boar’s tusks, lies the gadā (mace), one of Visnu’s principal symbols. The two personalised treasures (padmanidhi and śaṅskhanidi) are set below the boar’s belly, whereas Brahmā sits beside the cakra, with a devotee drinking from his large sacrificial spoon. A large nāginī or serpent-goddess, identified by a hood of multiple serpent heads, fronts the image; she rises from a tortoise. Both belong to the imagery of the waters, the tortoise having been used as fulcrum or pestle when the Milk Ocean was churned, another creation myth. The jar of amṛta, the liquor of immortality, lashed to the boar’s tail by a complicate knot, the fanciful little cap and the little ropes knotted around its ankle, are all odd touches of whimsy lightening the rather overburdened iconography and heavy form of this image. No explanation has yet been found for the stump rising up behind the boar’s head, a feature of all these images.